These luxury flowers are inspired by the masterpieces housed at The National Gallery. 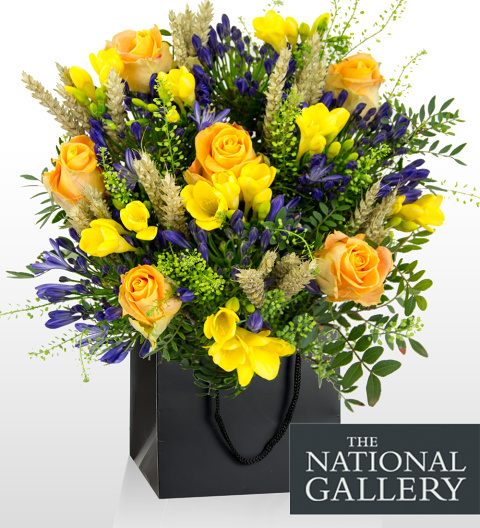 Each bouquet is beautifully arranged by our floral designers exclusively for The National Gallery. 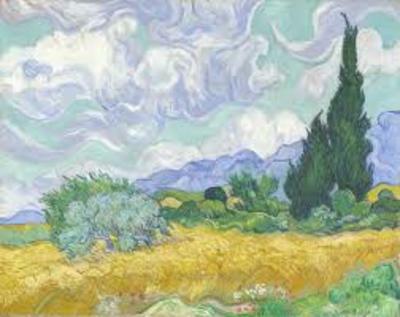 A Wheatfield, with Cypresses is one of three near identical paintings by Van Gogh. These works were inspired by the view out the window towards the Alpilles Mountains while Van Gogh was in the St-Rémy mental asylum, near Arles. We have carefully selected the perfect combination of Morning Roses, sweet-smellng Freesias, and wheat to represent the warm colours of the dense wheat field. We chose Thlaspi for the olive trees in the distance and darker green Pistacia to represent the Provençal Cypress that towers above the rest. The blue mountains and swirling skies, which feature in many of van Gogh's fine works are symbolised by the addition of blue Agapanthus.